How a graffiti kid got into streetwear, started the biggest trade show in the industry, and decided to leave it all behind at 34. Following the music, people enter the soaring grandness of Las Vegas’s Sands Expo, pass the lobby signs, then walk towards the huge lit jeep-sized letters that spell AGENDA. DJs, MCs, buyers, designers, company-owners, skaters pro and am, and the industry’s most VI-VIPs enter the convention center and spread across its massive floor. Agenda is the biggest, brightest, most competitive, most progressive, most I-saw-this-famous-person-there trade show in streetwear. (A trade show is a gathering of the sellers and big buyers in one industry.) And while people argue about what exactly “streetwear” is—mainly hats, hoodies, sneakers, and especially t-shirts—fewer argue about the sales: around $80 billion USD, almost one-third the value of America’s $250 billion fashion industry. This is why the scene here is so over the top. Few notice Aaron Levant, who moves within a pack of employees wearing what he’s wearing: a black t-shirt and cargo shorts clipped with a big, screeching radio. The guy who guy started all this 15 years ago—who has done as much as anyone else to turn streetwear into the convention center-filling behemoth it’s become—is indistinguishable from his crew. And now, at 34, he is stepping away. Until Agenda ends, though, Aaron is very, very busy. On this February day in Vegas, he has to introduce Jaden Smith, host approximately three dinners, and shake hands with too many of the 3,000 people in attendance. He moves with the dark pack, nodding at industry people while telling his crew what to do, and, sometimes, often talking on his phone and radio at once. Tonight he’ll don pants and a jacket, but keep the shirt (which also says AGENDA). Things have changed since Agenda’s extraordinarily humble beginnings in 2003, when Aaron was still a teenage graffiti nerd, living at home and prowling other trade shows to poach customers, trying to lure them to his own shuttle bus outside. Aaron tracked the kid down on Instagram and eventually hired him. This blend of gritty hustle and corporate solidarity is Agenda’s signature vibe, and what’s kept it desirable—and, frankly, interesting—all these years. That this is also the core of streetwear’s vast appeal is no accident. 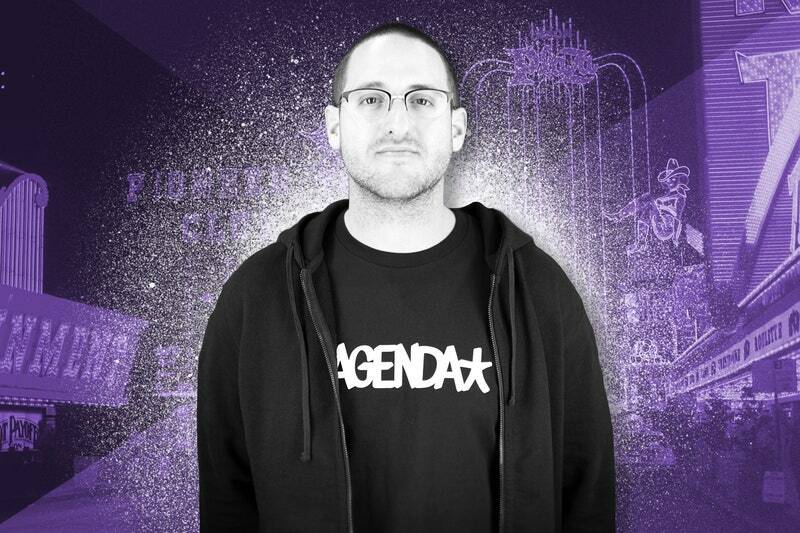 From the beginning, both Aaron and Agenda had hustle, and still do. Throughout the years, the growth, the celebrities, the partnerships, and the not-profitable-stuff-becoming-extraordinarily-profitable, Aaron has always found ways to undermine his operation at just enough to keep it interesting and to keep buyers lining up. Levant grew up on the outer reaches of Los Angeles, with a fashion-savvy mom, a dad who wrote for Happy Days, and two sisters who followed all the rules. He was what he calls “oppositionally defiant” since kindergarten. He was also dyslexic and changed schools often—“weird,” private, granola-y schools, one of which had no grades. He lasted a week in 10th grade, spent three months at a Tahoe boarding school, then was shipped north to one of those wilderness academies. He ran away and called a taxi. This ended his formal education and began another. By seventh grade, Aaron was into graffiti heavy. You might know it as “the culture”: tagging, hip-hop, skateboarding, and, to his parents’ displeasure, smoking weed and ditching school. It informed everything else he did. In graffiti, young Aaron found a love for lettering, graphic design, and the idea of art created in and on the public domain, and how the domain’s size and shape influenced the work. He collected anything related to graffiti—books, videos, party fliers—and then started a ‘zine and website, then made t-shirts, which he sold. Eventually he stopped tagging altogether. A graffiti friend named Tal Cooperman introduced Aaron to Luis Antonio, who ran GAT (aka Gypsies and Thieves), a seminal streetwear brand that surfaced circa 1990 alongside other labels like Fuct, Freshjive, and X-Large. Aaron calls these “OG brands.” Others call them “first-generation.” The companies were all young, LA-based, and hired graffiti artists as graphic designers. Aaron began a shadowy, ongoing, definitely unpaid internship with GAT and Luis, carrying boxes and archiving the sort of flyers that used to cover tables in shops around Melrose. One flier advertised Agenda, a warehouse party with DJs and artists. He went to his first trade show in “the late 90s,” something called Action Sports Retailer, the industry’s biggest at the time. Manning various booths? Some of his favorite graffiti writers. Work it did. With some $5,000 he’d saved living at home, he printed postcards and rented a shuttle bus and a Thai restaurant across the street from ASR, the better to poach customers. Only 30 brands and around 250 buyers came, but some were big buyers. Bloomingdale’s was there. So was Fred Segal. Some were from Japan. And after a while, so was the Long Beach fire marshal. This created an experience true to the culture that show-goers still feel today: Agenda is where hustlers rubbed elbows with the industry’s elite. Soon Nike SB had a booth. So did Leica. But last year at Long Beach, so did The Droors—a preposterously obscure '90s brand that preceded DC Shoes and flowed riders on XYZ, the wildest team in the whole history of skateboarding. Agenda became bigger, better, and even more of a no-holds barred enterprising tornado. You might run into skate legend Rodney Mullen at the Patagonia exhibit, or a Persian rapper named Josephine at the press table, or Lil Wayne around the taco trucks, or a young entrepreneur in the parking lot with a hockey bag and GAYKK blasted across on his fingers. None of this is by accident. Aaron wants stars, aspiring-stars, and pure riffraff in the same loud room with garage ops and billion-dollar corporations. It creates contrast, which creates the artistically gritty vibe that makes streetwear (and hip-hop, grafitti, skateboarding) so magnetic, and made Agenda famous. It’s still the draw today. Agenda became a meeting place for the most important money and minds in the industry, and in 2013 Aaron partnered with Reed Exhibitions, the world’s largest trade show organizer. Four years later another partnership yielded ComplexCon (yes, that Complex). After Agenda closed, Aaron went to Napa with his wife, then worked another event. Nike’s Ron Walden is taking over Agenda’s ventures and Aaron remains involved, sort of like how crusty old academics or corporate guys never quite leave where they work. Except that he’s 34. And stepping away from an empire built with two decades of hustling and a very different outlook of the world around him. An agenda that began with a headstrong kid who didn’t like what everyone else was doing. He won’t say what’s next. Whatever it is, expect bright colors, record sales, and genre-shifting results. Expect a show, with a signature vibe: one of old newness, formal disorder, and turning what’s uncool against what’s cool to somehow make it...cool. And profitable. Agenda lives on, minus the JNCO booth.